Tahlequah Public Schools is committed to providing all students with a quality education within a safe and caring learning environment. One of the main focuses in their district is the ability to integrate interactive fitness into their Physical Education curriculum. 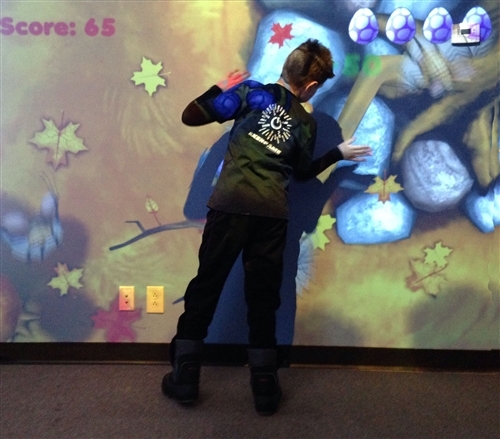 Recently multiple schools added the EyePlay Wall Exergame Projection System. Children and indeed the staff love the EyePlay Wall. Instantly, the interactive gaming system captures everyone’s attention, ignites children’s imaginations and encourages exercise. The EyePlay Exergame Surface will turn any wall space into a multi-point interactive experience. This interactive surface, which can be as large as 18 feet wide, creates a fun, exciting, and engaging experience by tracking users shadows with highly accurate motion sensing technology. With the EyePlay you can even leverage it to promote your brand or advertise sponsors with unique interactive effects while games are not being played. Logos can even be inserted within the game architecture to maximize brand equity. This useful function provides you with a versatile and practical way to optimize the use of EyePlay for the benefit of your facility. To learn more about how the Exergame Projection system can be added to your curriculum or child care center, contact us for more!